Offering turf aeration services can be daunting for a lawn care operator (LCO) because customers often don’t understand how aerating can benefit their lawns. LCOs may opt out of offering aeration because they have limited manpower or a competing lawn care company offers cheaper services, says Rich Clark, account manager for Billy Goat Industries. Aeration can be a lucrative add-on, as the going rate for the service is $10-$20 per 1,000 square feet, with a minimum charge of $100 per aeration, not including seed costs, according to Clark. These tips can help increase aeration sales. 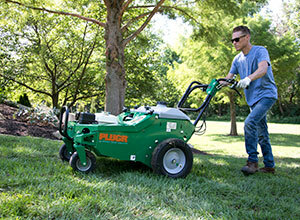 Educate customers about aerating. Provide healthy lawncare tips on your statement of service, website and social media platforms. Explain that aeration reduces compaction, increases air circulation, allows more water and nutrients to get to the roots, helps thicken and deepen roots, and reduces thatch. When aerating warm-season grasses, explain that more aeration holes are better, and the more rhizomes and stolons are cut, the more shoots will grow. Set reasonable expectations. Clark recommends helping the customer understand what they should see in their lawns and offering information such as seed germination time (generally 7 to 14 days). Ensure customers understand how to take care of their lawns once service is completed. Let customers know how much and when to water. Explain that there will be plugs on the lawn for a short period — which will break down when watered as directed — and how the plugs can help the seed germination process before they break down. Offer quality aerations. Avoid only doing a single pass when using a drum aerator. That is only 4 holes per square foot, with ¾ inch tines for a total of 1.5 square inches of disturbed ground out of 144 square inches. This is only 1 percent of the total area. When using a drum aerator, a minimum of two passes or more are required to complete a quality aeration. Charge appropriately. Benchmark pricing with the best lawn care operators in your area and fully understanding your costs. Don’t sell a new customer aeration the first time you talk to them. Give him or her a chance to get to know you. Establish yourself as the expert and a professional. Consider offering referral bonuses to customers. Provide references for your work. People don’t like a hard sell, but they appreciate and will pay for a professional. 1 Comment on "Top tips for selling aeration"
By way of setting expectations, it may be necessary to aerate more than once in some situations, and the customer needs to understand that if applicable.